Wales is steeped in history and legend. Read about the lesser known places in Wales including its history, great haunted castles and legends including Arthurian and the great magician Merlin. Not forgetting the beautiful award winning beaches and coastlines of Wales. Around 6-7 miles west of Cardiff, in the Vale of Glamorgan, down a quiet country lane off the A48 trunk road, are two ancient burial chambers from the Neolithic Age. To get there, get on the A48 west of Cardiff and follow the signs for Dyffryn House once in the village of St. Nicholas. Go about a mile down that road past the entrance to Dyffryn House and a sign will appear in a lay-by on the right-hand side of the road indicating Tinkinswood Burial Chambers. And finally, to get to the site, you then need to walk cross a stile and walk across two fields. Although not a large attraction it is another of the places to visit in Wales that I would recommend that takes you off the beaten track. Tinkinswood is a burial chamber that was constructed about 6000 years ago and during an excavation in 1914, the chamber was found to contain the remains of 50 people together with earthenware and stone tools from the Neolithic age. It is believed to have been attached to the village of Tinkinswood. The soil in this area is highly fertile and there are many rocks lying around that would have been ideal for tool-making, so it is understandable why Neolithic man would have settled here. What caught my imagination was the size of the capstone. Weighing in around 40 tons and measuring 7.3 X 4.4 metres (24 X 14ft ), I had an image of how the stone must have been put into place with hundreds of men pulling and lifting, and perhaps levering it into place. 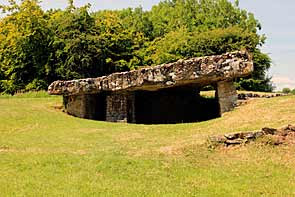 And what is more surprising is that this dolmen, as such burial chambers are known, predates Stonehenge by around 1000 years. 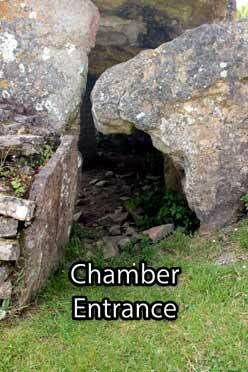 Situated within a courtyard, originally the chamber would have been covered by an earth mound, but over the years this has disappeared. perhaps there was a Welsh relative of Medusa at Linkswood! 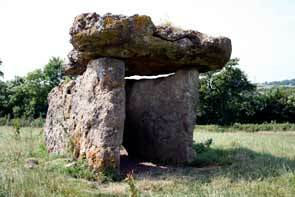 Known as Gwal-y-Filiast, St Lythan's Burial chamber lies about a mile further down the lane from Tinkinswood. This is not quite such a large site and there is just one single stone chamber remaining from what was once a much larger structure. 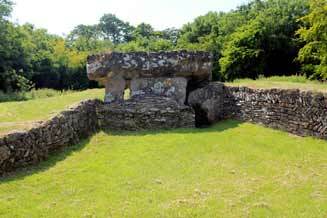 St. Lythan's is also around 6000 years old and was also covered by an earth mound. It's size has been estimated to be around 24 X 11 metres (80 X 30ft). The capstone here is still quite a size, but smaller than Tinkinswood weighing in at a mere 35 tons, but it still would have needed many men to place this in position. Human remains and pottery were discovered here during the mid to late 1800s.